We regularly review some of the best homework help resources available. There are ideas here to help all children, so please take a look. These resources are ideal both for supporting and extending the work done in school, and for home schooling use. Some of the resources help with early learning at home, in preparation for the start of formal schooling. The selection includes books to help develop key skills, such as learning tables and telling the time. Take a look at Study Guides too. Scratch coding is a language designed by MIT specifically to help children learn to code, and it is widely used in schools, to align with the computing curriculum. An understanding of computer science and the ability to code is becoming ever more essential in our technological world. They are skills that children need and will benefit them throughout life. Help your child get a head start and enjoy the satisfaction that learning to code will bring; there are lots of games to create and this will give children enormous satisfaction. The book explains, through well-illustrated simple steps, basic coding concepts and how to build fun games. This book encourages children to think analytically and problem-solve, while helping them develop an essential skill that will last them a lifetime. It's very comprehensive yet easy for children to follow; the extensive use of diagrams and illustrations gives readers confidence that they are on the right track, as they see these translated to the screen. An excellent manual. As regular readers will know, I am a big fan of wipe-clean books, which give children the opportunity to try things over and over again without worrying about making mistakes. By the conclusion of the book, children (recommended age 5 - 7) will have learnt about the difference between proper nouns and pronouns, about verbs, adverbs, adjectives and synonyms, as well as different tenses and common punctuation. It's not always easy to explain grammar rules to children, so the clear explanations with plenty of examples which are offered by this book are valuable. The activities are well selected and appropriate to the theme; the instructions are easy to follow and the approach and images are all very child-oriented. The book has a practical lie-flat spiral binding for ease of use. An excellent book which will really help learning. Early number learning for children age 4 - 6 will be fun with this colourful wipe-clean book. Easy-to-follow, practical activities help young learners get to grips with the numbers one to ten. You can be confident the book fits with curriculum requirements, as is devised by experienced mathematics consultant Caroline Clissold. The clearly presented age-appropriate activities explore counting, number properties, the concept of equals, and addition and subtraction. Appealingly, each section is themed around a well-known traditional tale - The Three Billy Goats Gruff, The Elves and the Shoemaker, The Gingerbread Man and Jack and the Beanstalk. This is a brilliant idea as children will really enjoy the way the stories are incorporated and it's a good cross-curricular mix of numeracy and literacy, shwoing children how they can work together. There are helpful hints for parents through the book. Wipe-clean books are an excellent way to build children's confidence, as mistakes don't matter. They can also be used over and over again to reinforce learning, or with more than one child. I love this book and children will really enjoy learning how to use numbers with its help. This book (and the two which follow) are designed for the new times tables check which all children in Year 4 will have to sit. This book is the first in the series designed to prepare children by supporting their learning and understanding of times tables. Each workbook provides a range of activities to encourage practice, including problem-solving activities, games and quick-fire quizzes - all these help to develop quick recall. The book is ideal for use at home or in the classroom. An accompanying Teacher's Guide is also available, providing lessons and activities to build confidence and fluency in times tables. In Year 4 (age 8 - 9), children will be sitting the new times tables check; the check is voluntary in the academic year 2018 - 2019, and is expected to be statutory the following year, so now is the time to prepare. Each book uses concrete resources, problem solving and reasoning to build a mastery of multiplication and division, not just rote learning - this is an important aspect, as it's all to easy to rely on going through the table to get the answer - and that's slow and tedious. Helpful tips are included throughout, and the book uses situations and objects familiar to children to make times tables relevant. A useful feature of the books in the series comes with the link to the free online test for additional practice. I'd recommend getting all three books in the series, to ensure that children have a logical progression without either undue repetition or missing out on key facts. The books are well laid out, easy to use and with plenty of helpful advice included; this book includes challenges for children to set adults, so be prepared! There are games to enjoy too - a great way to strengthen learning. It's a good series, well set out and easy to use, with plenty of opportunities to practise this essential subject - constant practice may seem tedious to children but it really does pay dividends and these books make times tables as interesting and relevant as possible. Wipe-clean books are excellent for building confidence, as children can keep trying until they get it right - and go back to the book for revision purposes too. Time is an integral part of daily life - not only telling time on the clock but also in concepts such as now and later, yesterday and tomorrow. The range of topics covered is excellent and includes telling the time on a digital clock, using a calendar, reading a timetable and understanding the 24-hour day. The answers are included, as are notes for grown-ups and fold-out clocks on the back flap. With its lively presentation and clear explanations, children will find this a very supportive book to help with this essential topic. The Usborne Key Skills series supports maths taught at school and is also very useful to home educators. Say "geometry" to a child and they might think "boring" - but not with this book! Supporting the KS2 maths curriculum, this book helps children understand the properties of a wide variety of 2D shapes, including kites, parallelograms and hexagons. Children will also learn how to draw, reflect and move them on a coordinate grid, and here the wipe-clean pages are a real asset, allowing the opportunity to experiment without feeling they must get it right first time. The lively animal characters who introduce the activities will appeal to children and encourage pleasure in their work. The answers are included behind a fold-out end page, which also includes a useful grid for additional practice. An excellent way to reinforce learning about the subject. Coding can seem daunting - it does indeed have its own way of thinking and this book does an excellent job of clarifying what that is - even for the absolute beginner. Programming needs a grasp of the basics - coding - so here's the ideal start. The book introduces central concepts such as loops, data types, pseudocode and calculations using a set of dice, a deck of cards or a pack of dominoes. By this means, the novice coder will practise and develop key skills such as critical thinking, creativity, logic and problem-solving. Only then is it time for the computer! Think Like a Coder discusses the basic programmes that are available for beginners, keeping a focus on simple activities that draw analogies with the outside world to make learning easy and fun. Excellently presented, even if you think coding is not for you, I ugre you to try this book, which may well make you change your mind as you learn how fundamental the processes are to so much of modern life - and they enhance thinking and reasoning skills too. It's written to be suitable for children and adults so it's great to work through together as you share in learning about this fascinating - and essential for children - topic. The presentation is lively and engaging - an excellent book. The write-in format of this book makes it ideal to encourage children to jot down ideas. The book is laid out in the way children will write their stories, starting with ideas, characters, scenes and more, then moves on to the beginning, middle and end of the story. With colourful illustrations throughout, which will stimulate ideas, it has practical prompts and ideas from bestselling children's author Christopher Edge for building plot, action, characters, scenes, beginnings and endings. There's plenty of space to draft the story and note down ideas, and the book makes a good lasting record. It's ideal for parents and teachers to encourage creativity and writing for fun, for homework or for story writing competitions.I particularly like the fact that the focus of this book is short stories; if children find writing difficult, it's fra better to encourage them to start off with short stories which will give immediate satisfaction, building confidence to move on to longer stories. Creative writing is something that doesn't come easily to all children; it's also a common focus in schools as they work to improve imagination, fluency and confidence. This comprehensive guide includes all children need to improve their creative writing - story prompts, plot suggestions, character ideas, how to write dialogue, setting the scene and writing tips. Throughout the book, children will be interested in the inspiring quotes and extracts from well-known authors. There are blank pages to write your own stories and jot down ideas, plus an elastic closure to keep it all together. This book has a valuable place in the home, to support and inspire children through its wide range of ideas. As the book is in write-in format, it can also be used as a useful notebook through KS2, as children learn new skills and develop their thinking and imagination. An excellent book with a generous amount of space for children's own ideas. This book is quite fascinating to browse through - I really found it engrossing and I am sure adults will love sharing this with their children. Why do some say time started in 1980? What was the first two-person computer game? What';s a speghetti code? How could books grow on trees? Find the answers to these questions, along with lots of other curious, amazing and mind-boggling facts, in this eye-catching book that is absolutely bursting with information. Packed with illustrations and diagrams on cloourful backgrounds, it's an easy read; the glossary and index are useful features. The book shows how quickly and constantly numbers, computers and coding are changing; it also highlights the close relationship between all three, in a fascinating and revealing way. This is a lovely book to dip into, and should be of interest to everybody who wants to know more about our world and why things are the way they are. Many children are fortunate enough to have their own tablet computer and this fun, friendly guide is all about coding on a tablet computer. The book uses the free ScratchJR app; Scratch is commonly used in schools, so this has the benefit of giving children a head start. Young learners will discover how computers work and how to tell them what to do using code. This is followed by simple, step-by-step instructions to code stories and games including a fairy garden, a pet monster and a space game. The clear explanations are are broken down into simple stages which easy for anyone to follow, whether child or computer-challenged adul;t plenty of illustrations and diagrams help too. Links to websites and helpful notes for grown-ups are included in this practical introduction to coding, which is ring-bound for ease of use. Children's logical thinking and reasoning skills will also benefit from the book. Children will be encouraged to learn to develop pencil control and the correct letter formation, the foundations that are esential for developing good handwriting, by using this colourful book. The book sratrs with shapes and lines, then progresses through the letters which are grouped by type. OUP have developed the Progress with Oxford series to help every child develop essential skills at home, with minimal help and support; however, I do think that, at this young age, children still need parental encouragement, so even if they are working through the book alone, try to be around to help and encourage if necessary. Picture clues show children how to complete activities, and the reminder boxes, tips and advice support older children to become self-sufficient learners. A lively character, Jot, accompanies all the colourful and engaging activities, and fun stickers are included. A progress chart at the end of the book encourages children to assess their own learning. The book certainly is easy to follow, and the activities fun and engaging. This Progress with Oxford: Number Problems Age 4-5 workbook will help your child to progress with number skills while having fun so they will quickly learn to solve problems that involve doubling, halving and sharing. As they work through the book, they will be accompanied by Harv, with his useful tips and friendly comments. The book is clearly laid out, with brief explanations followed by lots of practice questions which will ensure children have really grasped each learning point. The colourful stickers are a good extra incentive, and children can assess their progress at the end of the book. I always enjoy reviewing Priddy Books; they have a bright clear layout and use excellent child-friendly images.This book is designed to support learning in Year 1. Children will find a big difference as they progress from the freer learning style of Reception classes into Year 1, so giving them extra confidence by working at home will always prove beneficial. Wipe-clean books are a good way to boost that confidence too, as any mistakes can be easily erased and another attempt made. This book is full of colourful, age-appropriate, activities that support aspects of Year 1 English learning. Explanations are given and there are questions to reinforce learning - all of which are to be completed on the page. It is recommended that children just do one page a day; this is good idvice which ensures children won't feel overburdened. An excellent book to support learning. Updated for 2019! The Toppsta Reading Record is 24 pages and now has five pages of book recommendations, giving extra space for recording the books that have been read. The Reading Record also provides a space for children to practise writing a review, helping them develop not only their writing skills but also an understanding of which books they enjoy reading and why. Two pages are dedicated to writing book reviews as well as ten handy tips for writing a good review. Toppsta is the UK’s leading children’s review platform, the Toppsta Reading Record is a resource for schools, but it will be really good for home use too, and home educators will find it especially useful. 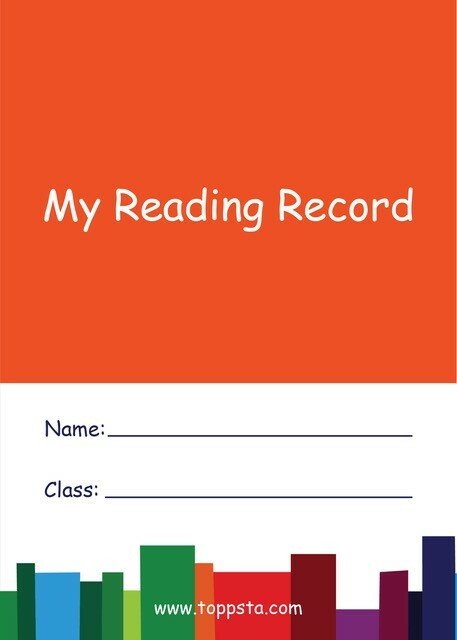 The free Reading Record is a high-quality and unique 24-page reading diary, designed for sharing between school and home. It would be good to see it available in libraries. It is hoped it will encourage more reading, as children try and hit the goals for 1, 5 and 10 books read. Remember though that reading is not a race - it's not about how many books children read, but about the pleasure they gain from those books. The Toppsta Reading Records have been distributed to Primary Schools in time for the new 2018/19 academic year and they contain book recommendations, selected by creator Georgina Atwell from a huge number of submissions by publishers, who have been incredibly supportive of the project. This is an excellent idea to stimulate reading, and will give children a lasting record to look back on. Maths was never this much fun when I was at school! Sherlock Bones needs help to outwit his rival Moriratty, and children can do so by solving a series of related maths problems. This book is arranged in four different levels, making it easy to work at the correct level for your child. There is a brief explanation for each topic (eg decimals, fractions) and then mathematical puzzles to solve using addition or subtraction. Each puzzle is great fun to do and colourfully presented, with plenty of variety; children will need to read the question and work out how to solve the puzzle - good to develop thinking and comprehension skills. The book also has the added benefit of showing how much we use numbers in everyday life. The numbers are all there, right on the page; just use Sherlock's secret solver to reveal them - but mind you don't lose it! This is an excellent book which covers part of the Number element of the KS2 curriculum in a lively and entertaining way that will certainly appeal to children and encourage them to see maths in a fresh light. The first thingchildren need when tackling this fun book is to know there times tables - so there's an incentive to learn! Based on times tables up to 12, children will enjoy dot-to-dot times tables, colour-by-multiplication activities, coding puzzles, Calcudoku conundrums, mazes, number pyramids and much more. With over 100 puzzles, there's plenty to keep children thinking and using those times tables - and to encourage them to revisit them if there are any they are not sure about. There's also explanatory information to complement the puzzles and the written questions help children to learn to read carefully and apply what they have read. The book gives a real purpose to knowing times tables and will help embed them. Another new title in the excellent Buster Books' Brain Games series, this book includes all manner of word puzzles - there are sudokus, anagrams, crosswords, missing letters, word searches and many more. With over 100 puzzles, there's plenty to occupy children, and they can enjoy challenging their friends too. They are all designed to help children expand their vocabulary and thinking skills while having fun. All the answers are provided and I like the fact the book has plenty of pages at the back for children to work out the answers. This, and its companion books, are a great way to encourage children to keep learning over school holidays, as they really enjoy the challenges presented. This is one in a superb series from DK, which covers the key subjects taught at school; each comprehensive book includes all that chiildren will need to know and together, they build up into an excellent reference library that can support children right through primary and often on to secondary school, as this particular title does. Computer science is a fast-moving field and this book covers the principles, from hardware to computer coding and also looks at what the future may hold. Data to digital life, computer coding to cyber attacks, this comprehensive and up-to-date book includes comprehensive facts and information on the subject, presented in a highly visual fashion that will appeal to children and teens. It covers both the technical aspects, such as the latest digital devices and software, and how the Internet works, as well as staying safe online, digital etiquette, and how to navigate the potential pitfalls of social media. An excellent index and comprehensive glossary add to the reference value of the book, making it easy to use. This book is described as 'A Fun First Guide to the Maths of Measuring' and it encourages children to explore the world around them and enjoy the fun they can have measuring all manner of things. This increases their observational skills and appreciation for what is around us. Children will learn how to measure everything including length, weight, volume, temperature, and time through colourful text and interactive elements. Simple explanations are easy to follow. All the activities relate to everyday life and will inspire parents to try out all sorts of measuring activities with their children. The final bedroom picture includes a fun quiz that gets children to measure and compare lots of things in the scene. There are plenty of interactive elements in the book to make information more memorable - and the book more fun, of course. Measuring is an important part of maths, and it's a skill that can be practised on a daily basis, supporting knowledge and enhancing learning; using the ideas in this book will really pay dividends. Maths has its own very specific vocabulary, and understanding the words used is a big and important step in enjoying maths and making it accessible. Clear, accessible pictures and diagrams support this first introduction to numbers, calculating, measuring, geometry, and data-collecting - the basics children will be learning at school. It's a practical guide with plenty of application to everyday life. Place value, number bonds, multiplication tables, and fractions are just a few of the maths concepts explained and reinforced in a variety of ways for children with different learning styles; this is a good point as all learners are different. Parents will appreciate the book too, as it shows the terminology used in schools, enabling them to help their children. Understanding the terms used in maths will really boost children's confidence; this colourful and accessible book will really help children, and their understanding will be vastly increased as they enjoy the wide-ranging activities. There are plenty of opportuntities in everyday life for children to increase their knowledge and skills about measuring; with the aid of this book, parents and teachers will find many more ideas. Full of puzzles and activities related to measurement, this is a fun to use activity book covering all kinds of measuring. It covers length and mass; perimeter and area; volume and mass; more units, followed by additional practice questions. Children will discover the different units and tools used for length, area, volume, mass and more - then write, draw, colour or sticker their answers onto the page. It gives comprehensive coverage of the topic and will be excellent for supporting school work in maths. Quizzes and practice questions complement the topic and make it easier for children to remember the key facts. Wipe Clean books are an excellent way to boost children's confidence, as they allow repeated tries without any commitment; this puts children's minds at rest as they feel free to 'have a go'. The friendly jungle animals are learning about grammar and punctuation and they are here to share their learning. The colourful activities support learning about sentence types, nouns, verbs, adjectives, punctuation and tenses. This is an activity book, not a textbook, so children will need to have covered the basic topics before practising with this book; this makes it valuable for supporting school and home learning. There are answers and practical notes for adults at the end of the book. These attractive books will be a great addition to any child's bookshelf. Great care has been given to the presentation - a far cry from boring dictionaries and thesaurii of old. Buy them as a pair - they work perfectly together. Ideal for children of 7+, this dictionary contains up to date coverage of a range of everyday and curriculum vocabulary, ensuring children have access to all they need for KS2, including curriculum requirements. Side bars with the albhabet make navigation easy as the key letter is highlighted. The main word is in blue, with plurals and root words as appropriate, on its own line, followed by the word class and definition(s). Where needed, examples of sentences are included to clarify. Some antonyms and synonyms are included plus a few diagrams. The Word Wizard section provides in-depth support on spelling, punctuation and grammar. This book is designed to build confidence and develop language and dictionary skills at home and in the classroom in preparation for secondary school.There are tips on grammar and spelling to help students understand how to use language more effectively. A lovely hardback book which will really encourage children's interest in words. The essential companion to the book above - all KS2 children need to use words in the best way possible. The attractive presentation makes the books enticing to pick up and dip into, perfect to increase children's vocabulary and love for words. This thesaurus provides support for students’ creative writing and helps build vocabulary - always areas of concern for schools so this will be an excellent classroom as well as home resource. There are full definitions for every synonym and sample sentences for each word so children understand how to use them. A simple, step-by-step introduction shows children how to get the best out of their thesaurus - something that is often overlooked. The colour headwords and A-Z bar on every page make it easy to find the right word. Thematic pages help build vocabulary through carefully selected visually-appealing illustrations. The Writing Wizard section is full of useful ideas. This excellent and attractive thesaurus will stand children in good stead throughout KS2 - so it's good it's a durable hardback. Recent figures (2018) show that 4 in 10 children do not reach the expected maths standard at the end of Year 6. That being the case, changes in teaching are needed and a method that has recently come to the fore is the Singapore Method. The Singapore maths teaching method teaches mathematical concepts in three stages: concrete, pictorial and abstract. This first book, suitable for Year 1, covers numbers up to 100 and place value, this is a clear and simple introduction to mathematical concepts taught in the UK year one syllabus. Parent and teacher notes are included throughout, making the book a valuable resource for any home or classroom. This colourful and well presented book really draws the reader in by good use of colour and graphics, making it easy to navigate and find the information you want. The explanations are clear and simple, really giving confidence to parents helping their children. Using simple pictorial exercises and an engaging mascot, Master Maths applies its highly effective technique to the UK maths curriculum, making learning easy and enjoyable for children. These are not workbooks but teaching aids which explain the concepts simply and clearly - a book for non-mathematical parents as well as their children. Children are guided through the books by Pango, the maths loving pangolin, who will become a familiar friend as they progress. Children are encouraged to think for themselves using the Singapore method - each unit of the book begins with a question or statement that encourages children to begin thinking about a new mathematical concept. This is followed by visual explanations which make excellent use of colour and graphics to get the point across. The hands-on activities that follow lead children to a deep conceptual understanding that will stand them in good stead as they progress on their maths journey, giving them the in-depth understanding they need to work things out for themselves. Each of the books in the series has a series of practical hands-on activities that can be used to support the learning; a list of tools for success in each book is customised to the topics covered and gives practical ideas for equipment that can easily be supplied at home. The layout throughout is clear and uncluttered, making good use of pastel colours and plenty of space on each page, broken up by clear boxes for information. The tips for parents and teachers are very useful. An excellent series which will really support children's learning. This book really struck a chord with me - incorrect punctuation really grates on me so it's good to see such a considered discussion of the correct usage of punctuation. Starting with the history of punctuation (can you imagine reading a book with no punctuation, not even any paragraphs? ), it continues on by examining various punctuation marks, not just the apostrophe, although that is, of course, the ones that produces the most problems. Chapters include 'Things that clarify'; 'Things that show emotion'; 'Things that don't matter any more' and 'Things that have no rules'. Engagingly written, the book is highly readable and will make you think about the way you use punctuation - and that's got to be a good thing. Maths Quest is an excellent series of books which is designed to help children practise key maths skills in a fun and lively way. Following on from series one of Maths Quest, these new adventures help develop maths skills through an exciting adventure. They will learn as they go without even realising it! In this exciting story, the reader is lost in the 4th Dimension. To get back to Earth, you need to follow the clues which are throughout the book; mathematical skills are needed and this book focuses on measuring skills. It's excellent that each book uses a different skill. To solve the problems in Attack on Circuit City (Maths Quest) , young readers will need to call on their statistical knowledge. Under attack by bugs, bots and viruses, your computer needs your help. Finding the answers will enable you to advance through the story, following the clues which are dotted along the way, and learning more about maths – especially statistics - with every step you take. Finding a treasure map on the Island of Tomorrow promises great riches - but only if you can avoid fierce creatures, freak weather, and other geometrical perils. Success brings membership of the Explorers' Club? Use your problem-solving skills and geometrical knowledge to help save the day! Finding the answers will enable you to advance through the story, and where you go depends on the answer you give, so it could be different every time - keep trying! Readers will need to bring their knowledge of numbers to the fore to Escape from Hotel Infinity (Maths Quest). Seeking shelter from a storm, your troubles have only multiplied … can you get to grip with numbers and Escape from Hotel Infinity? These follow the very successful first 4 books in the series. The books are superbly illustrated in a comic-book style that children will love. The jazzy presentation is perfect and the friendly approach is a great way to instill confidence. A super series that really makes maths enjoyable and meaningful. Computer coding opens up a whole range of exciting possibilities for children; it's great that it is part of the curriculum as it really opens up a world of opportunities. Throughout this book, children are encouraged to undertake a series of imaginative and challenging activities. It starts with the basics, explaining coding and giving simple activities to help children understand the basic principles. It then moves on through a series of exciting projects including animating a character, coding a tube, creating a webpage and making a game. With extras at the back of the book including a game, a pull-out poster, stickers, and even a robot model to press out and make, this is the must-have book for any future junior coders. It's straightforward and does not require any previous knowledge. Ideal for coding clubs in school as well as for home use. Coding is a key part of the computing curriculum so it's good to see these four books which show children just how much fun coding can be. Children will learn to draw characters, animate plot lines and create games as they create their own quest to complete. The straightforward, step-by-step instructions are illustrated in a graphic novel style which will appeal to children. Through simple and practical tasks such as drawing shapes and giving instructions in code to building games, this adventure book makes learning to code fun and accessible. As well as teaching the essentials of coding, the book will also encourage children's imaginations, and give them a challenge that really encourages thinking. Follow Major Kate on her space mission to save Planet Zyskinar. The layout is clear and it's easy to follow the progression of the instructions; there are plenty of images to help too. The books take a lively and fun approach by creating a story, and they work really well as a cross-curricular resource as the topics fit well as part of the curriculum. Also available are Code Your Own Pirate Adventure: Code With Pirate Pierre and Find the Lost Treasure (Little Coders) and Code Your Own Knight Adventure: Code With Sir Percival and Discover the Book of Spells (Little Coders) . It's good to see there are four books in the series - these offer plenty of opportunity to develop skills as well as ensuring children find a topic or topics that appeal. A super series. When asked to write a poem, children can often feel at a loss for ideas, but with this book to hand, they will find inspiration to get those creative ideas flowing. Overflowing with exciting and innovative activities such as making poems out of leaves, carving out a mud poem, going on an outdoors simile hunt, and playing poetry games in the playground, this enticing book is packed with ideas to prompt children to enjoy creating their own poems. Whatever level children are working at, there are useful tips and starting points, all well explained and clearly presented. Well-known poet Joseph Coelho explores a selection of poetry: from laughable limericks to poetic puns, and from ridiculous rhymes to silly sibilance in a way that will really inspire children. Teachers will find this book invaluable when helping their pupils write poetry - it is packed with easy to implement suggestions which are hugely varied, ensuring there is plenty to inspire everyone, and to give children confidence in their own abilities. A really excellent book, highly recommended. As parents, we all know there is plenty we can do to help our children prepare for the start of school - but we don't always know where to begin. That's when books like this are invaluable, giving an outline to follow and principles to build on. Children respond well to the Fun and friendly characters Bip, Bop, and Boo, who take them through the book encouraging children to start developing their reading skills with simple words and exercises. Children will practise their phonics skills by reading letter sounds, finding missing sound stickers, and then by blending letter sounds to read their very first words. Featuring over 90 colourful stickers, the hands-on activities are well designed and show children that reading really is fun, at the same time building confidence. This book is Level 3, for children with a good and growing vocabulary. ... and you don't even need a computer! This introduction to coding, which is suitable for very young children, guides through the first steps which are needed before using a computer for coding. Coding may seem a daunting topic for young children, but it does encourage logical thinking and it's surprising how naturally it comes to children when it is started young. The lively fun approach of the book includes lots of flaps, wheels and sliders which show how to build a robot, hunt for bugs, escape from a jungle and more. The approach is very simple and straightforward, with every step clearly explained. The sturdy board pages mean the book will be durable, ideal for school use. Parents will really enjoy working through this with their children - and it will help them understand coding too! Raspberry Pi is changing the face of computing, especially for children, who can develop their computer skills using Raspberry Pi. It is an affordable credit-card-sized computer that's a great introduction to computers and coding, accessible to everyone and hugely popular in schools. This Raspberry Pi Made Easy workbook is ideal for showing your child through the basics and giving them the immediate satisfaction of getting started, downloading software and running Pi. The book includes clearly explained and easy-to-follow fun exercises that let children draw, make music, play games, code with Scratch and Python, and much more. These are really satisfying and will encourage children to take steps forward in their computing progress. Perfect for Key Stage 2 pupils, Raspberry Pi Made Easy provides step-by-step guidance to build key computer skills. Help your child learn how to talk to a computer in its own language, for fun or for the future. Clear, straightforward and encouraging - a great introduction. With the subtitle "30 fascinating topics for junior mathematicians explained in half a minute", this promises to be an interesting read and one that will attract children who love succinct yet fascinating facts. Children ask questions endlessly and here is the answer to questions about measuring, data, sets... and much more that children will learn at KS2. The answers are't quite in 30 seconds, as there is an three minute mission activity that gives children a practical application of the topic. The book is excellently illustrated with diagrams which clearly explain facts to children in a way they will find easy to remember. If your child doesn't find maths enjoyable now, they may well do if you introduce this enthralling book to them. This is subtitle 30 fascinating viking topics for curious kids explained in half a minute and follows the excellent format reviewed above. In KS2, children will study the Vikings and this book is a really good succinct introduction that covers all the key points. With fast facts, mini missions, and engaging artwork, the book introduces one of the world’s most fascinating cultures. Children will discover all about these amazing warriors, including where they came from, their incredible skill as boat builders and seafarers and how they traded with and settled in other lands. Each topic is presented in a concise 30-second summary, supported by a 3-second flash soundbite and with many three minute missions too. There are also excellent and extensive glossaries for each topic - these are a really good feature. The presentation is excellent - enticing and memerable. "Ivy Kids produces beautiful books that will get kids making, creating, thinking, playing and dreaming. Covering all sorts of areas, including cool, contemporary kids’ crafts, awesome art activities, and fresh nonfiction topics, our books will get kids of all ages imagining, innovating, and above all, having fun!" I am really enjoying what I have seen so far from this innovative publisher and am looking forward to seeing what the future brings. Using road signs as a practical and familiar analogy as they tell car drivers how to behave on the roads, so punctuation enables readers to successfully navigate sentences and paragraphs. The analogy is clearly exlained at the start of the book, enabling parents to ensure their children gain the maximum benefit. This book introduces sentences and explains how punctuation helps a reader to understand meaning. Each concept is explained an then there are practical activities to check learning. The book includes finger puppets to make, which children can then use to track through the book. The presentation is lively and appealing and there are stickers to add to the fun. This time, the analogy used is streets - Just as there are lots of different types of streets, so there are lots of different types of sentences; the little car finger puppets help children trace their journey along the streets/sentences. This activity book helps children to recognise the grammatical patterns of expanded noun phrases, statements, questions, exclamations, conjunctions and commands. It's all done through clear, readily understood explanations, accompanied by a range of appropriate activities. Throughout, the bright, colourful activities are very much geared to children's interests and to familiar situations, so they are fun to do and very engaging - helped, of course, by the stickers! Again, Letterland use their tried and trusted method of teaching through analogy - this time, buildings. Words are like buildings that can be changed, developed and extended. Prefixes and suffixes are like the porches or extensions we can add to houses.The structure of the house remains the same, but the function is extended. In this book, children learn to use different types of prefixes and suffixes, learn to turn verbs into nouns, adjectives into nouns, and adjectives into adverbs. They are also introduced to compound noun and creating adjectives. All these will help them produce good written work, fiction and fact. A traffic light system is used in the book to good effect, ensuring children progress steadily; there is also an 'I can do' reward chart as an incentive. Keeping the consistent theme, stories are described as being like towns. In keeping with the recommended age, the explanations are more detailed and the questions more challenging, which is all very positive as it shows how children will have moved on through the course of the series. The activities are lively and colourful and there are plenty of stickers to enjoy too. This book shows children how to use the present and past tense of verbs appropriately and consistently in their writing. It introduces verbs in their progressive form, both in the present and past tense, in order to describe an activity that is ongoing.Each book in the series very much stands on its own, but by working through all the books, children will have a really thorough grounding in grammar which will stand them in good stead for the future. Book 1 is recommended for 5+; Books 2 and 3 for 6+; Book 4 for 7+. With computing, things don't always work out - children will learn that from a young age, and with this book, they will also learn to tackle problems and have the confidence to resolve them. This book, one of a series of four, concentrates on algorithms, and what happens when they're full of bugs. Children will learn how to write algorithms that direct computers to search, sort and make decisions; then they can try things out on the companion website - a great resource. The four books cover key areas of the KS1 computing curriculum with simple text. Each title contains practical on- and off-line activities that are easy to follow and fun to try on your own or with friends. Guiding young coders through each title is Data Duck - a computer-programming mastermind here to help with hints and tips! A really good introductory series which will give children knowledge and confidence. It's always good to see a different approach to learning and the unusual approach of this book is really effective. The book offers a fun way to practise spelling and learn tricky words - it encourages children to really think about their spelling, test themselves, and play spelling games. You'll find all the spelling rules children need to know and all the exceptions, with loads of tips and tricks to help kids spell well - the tips are really useful and there are lots of fresh ideas. The presentation of the book is excellent with ,lots of colour pictures to keep children engaged. The spell checker encourages children to look at words, cover them, write them, and then check the spelling, a proven method of learning how to spell. Comes with a wipe clean spell checker, which flaps out to be used on any page, and a wipe-clean pen. This really is the best spelling book I have seen, with a huge amount of content, covering KS2 pupils will need to know. Children will be learning to code at school, and that will hopefully stimulate their interest. This book is ideal for following the work up at home, and for having the satisfaction of creating games that really work. The book uses Scratch software which is commonly used in schools. There are easy-to-follow, illustrated step-by-step instructions, and each game is created over the process of a two-page spread, so they are reasonably succinct, producing quite quick results. The book is arrange by difficulty, with five different levels - by the time they reach Level 5, children will be challenged to produce really good games. They will learn to create all types of popular games including Tunnel of Gold,Up in the Clouds Snake and Brick Bouncer. The games use an excellent range of effects, so they are really worthwhile and children will have fun playing them - and sharing their games with others. The book supports classroom learning by teaching key coding concepts through simple and practical tasks from drawing shapes and giving instructions in code to building games and more. An excellently presented book, with lots of good games all clearly explained. Perfect for school coding clubs too. Much-loved author Julia Donaldson is just the right person to help children learn to read, as children know and love her stories. Songbirds is a complete phonics reading programme, part of the Oxford Reading Tree scheme, carefully created to support children who are learning to read. Children can enhance their learning through the phonics games and linked activities in this book, and parents have the assurance that this will tie in with the reading being done in school. The focus is on building phonics skills, with seven carefully written, very enjoyable and beautifully illustrated stories which introduce children to phonic sounds; each story has an introductory page to help parents. There is also a variety of linked fun activities plus reward stickers. It's colourful and engaging, really making learning fun, and the supportive approach makes it the perfect book for parents who want to help their children at home. Children now learn coding as part of the computing curriculum, and it will really help their learning if they have the opportunity to extend their skills at home. This easy-to-follow guide introduces the basics of coding, using the free programming languages of Scratch and Python - the languages most commonly used in schools. These step-by-step projects will have children talking to their own chatbot or making their own computer games in no time. The instructions are very clearly laid out, they really do take one small step at a time, and there are plenty of visuals so children can see exactly what they should be doing. Accessible, engaging and very child-friendly, children will learn, among other things, how to make a spaceship game, how to code an optical illusion and how to instruct talking animal sprites - they really are projects to capture children's attention. An excellent introduction to the world of coding. When I reviewed How to Write Your Best Story Ever! , I said " Children's confidence in their own abilities will really be enhanced by the book and the engaging presentation makes it a real must-read; a book that will be picked up time and time again." Created to work with its predecessor, this notebook contains even more hints and tips and is the perfect place for budding young writers to gather the ingredients for a great story. The colourful pages, with plenty of room for children's own writing, will really inspire them with its practical ideas. Particularly notable are the word webs, which are on many pages - these include a superb collection of words to extend children's vocabulary and to make their writing more colourful and interesting. The book includes ideas for building plot, action, characters, scenes, beginnings and endings; top tips from the Oxford word experts to further creativity and writing skills; and activity pages for jotting down words, sketching characters, and writing in stories. Ideal for capturing the sudden inspirations of a child's everyday world and surroundings, the notebook provides a fun and practical step towards creative writing that no child should be without. I fully endorse that - often children need inspiration for their writing and it is here in abundance. Writing, and especially creative writing, is almost always a key area of concern in schools. Start children off early on exploring the world of creative writing with this unusual and fascinating book. Children are encouraged to travel along the Story Path and to see where it takes them. They will find an enchanted world where fairy princesses battle with monsters from the deep and vampire cats zoom through the galaxy on silver unicorns. At every stage, young readers can use their own imaginations to take the story in whichever direction they choose; so, for example, the story starts with the child riding along on ... a dragon... an elephant... a plane ... a boat ... or a horse. With a simple, easy-to-follow structure and bold, quirky imagery, the book is so simple to use, but will inspire children and spark their imaginations. A superb classroom resource s well as being perfect for encouraging discussion at home. This series is simply wonderful for teachers who want to encourage their class's creative writing - every title is packed with inspiration. These story starters come from stories that will be familiar to every child, but now they can put their own spin on the stories. Inspiringly presented to appeal to those who respond well to visual stimuli, there are opportunities to write tales of travels through mysterious forests, or to invent new companions to help defeat a wicked witch, or to conjure up the ultimate punishment for an innocent prince. With stories to write, journal entries to fill in and pictures of characters to draw, the book perfectly fills the requirements of the National Curriculum for writing in different genres. As well as all this inspiration, there are writing top tips, fairy tale fun facts and mind-boggling puzzles to complete. A superbly presented book which contains a feast of unusual and inspiring ideas. Use the power of myths to encourage children to develop their creative writing skills - myths are some of the most vividly told tales children will ever read and this book, with its hugely varied range of ideas, will inspire children. Creation myths, gods at war, awesome acts of bravery, bold heroes and amazing creatures will inspire new characters to be created, new stories to be written, and may even even inspire a mythical comic strip to unfold. The book is really well presented, with plenty of illustrations, lots of space for children to complete their own stories, and nuggets of information about mythical characters, storytelling top tips and puzzles to make a complete and very valuable resource. Budding authors will have stories to write, journal entries to fill in and pictures of new characters to draw, all inspired by some of the best-loved myths from around the world, featuring not only the familiar tales of the Norse, Greek and Roman gods, but also the less well-known stories which have their origins in Central America, Australasia and the Far East. It's wide-ranging and will provide inspiration for many different stories. A superb series.